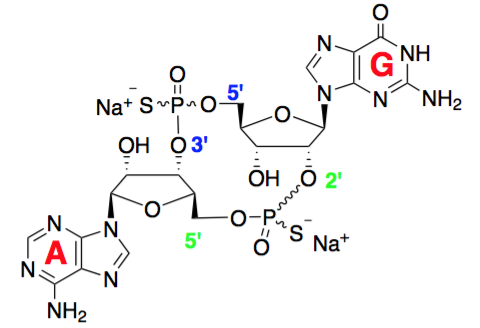 2’3’-cGAM(PS)2 (Rp/Sp) is composed of Rp,Sp-isomers of the bis-phosphorothioate analog of the mammalian cyclic dinucleotide (CDN) 2’3’-cGAMP . CDNs are microbial messengers that induce innate immune responses in mammals by binding and activating STING (stimulator of interferon genes; also known as ERIS, MITA, MPYS, NET23 and TMEM173) leading to TBK1-IRF3-dependent type I interferon (IFN) production [2, 3]. The most potent natural STING agonist in humans is 2’3’-cGAMP, a CDN produced in mammals by cGAS (cGAMP synthase) in response to double-stranded DNA in the cytoplasm [4, 5]. As STING agonists, 2’3’-cGAMP and other CDNs are being studied for their potential in immunotherapy and vaccination. 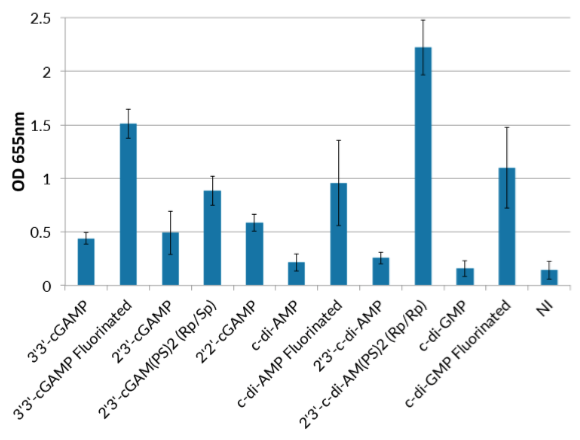 An obstacle to their therapeutic utility is their lability to enzymatic hydrolysis by various nucleases and phosphodiesterases, some of which are highly specific. 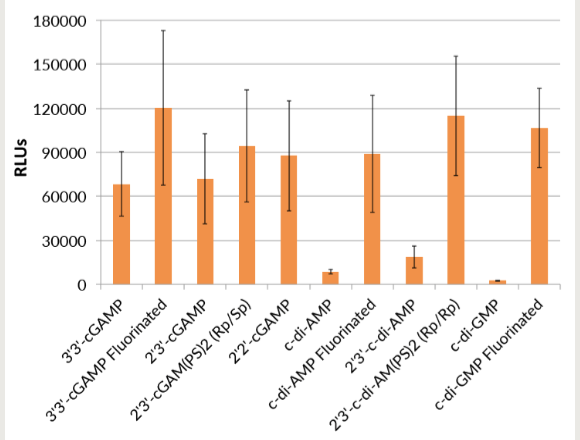 For example, the enzyme ENPP1 (ecto-nucleotide pyrophosphatase/phosphodiesterase) cleaves 2’3’-cGAMP but not other CDNs, such as its bisphosphorothioate analog, 2’3’-cGAM(PS)2. In fact, this analog is not only more stable than 2’3’-cGAMP but is also more potent . 1. Li L. et al., 2014. Hydrolysis of 2'3'-cGAMP by ENPP1 and design of nonhydrolyzable analogs. Nat Chem Biol. 10(12):1043-8. 2. Wu J. et al., 2013. Cyclic GMP-AMP is an endogenous second messenger in innate immune signaling by cytosolic DNA. Science 339(6121):826-30. 3. Sun L. et al., 2013. Cyclic GMP-AMP synthase is a cytosolic DNA sensor that activates the Type I interferon pathway. Science 339(6121):786-91. 4. Gao P. et et al., 2013. Cyclic [G(2',5')pA(3',5')p] is the metazoan second messenger produced by DNA-activated cyclic GMP-AMP synthase. Cell. 153(5):1094-107. 5. Ablasser A. et al., 2013. cGAS produces a 2'-5'-linked cyclic dinucleotide second messenger that activates STING. Nature. 498(7454):380-4. Synonyms: Di-thiophosphate analog of 2’3’cGAMP; c-(RpSp)-ApsGps; 2’3’-cGsAsMP. CAS number: 1637675-05-8 (free acid). Purity: ≥ 95% by LC/MS & NMR. Purity and structure has been determined by LC/MS and NMR: ≥ 95%. Biological activity has been assessed by measuring induction of the interferon pathway in THP1-Blue™ ISG cells. The absence of bacterial contamination (lipoproteins & endotoxins) has been confirmed using HEK-Blue™ TLR2 and HEK-Blue™ TLR4 cells. Product should be stored at -20°C.